PrintFolder Pro 3.21 is file & disk management software developed by No Nonsense Software. Using Windows Explorer, printing a list of files is hard work. In fact, it's almost impossible. PrintFolder Pro is a fast and efficient utility that lets you print a list of files in any folder (and in its subfolders, too, if you wish). Beyond being extremely easy to use, you can customize file lists to fit your own preferences. 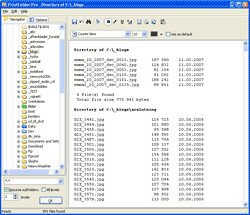 List filenames only, or include file size, date, time, attributes, and more. This system utilities software is shareware, which means you can download and use PrintFolder Pro 3.21 for free during the trial period (usually for 30 days). At the expiration of the period you will have to buy the file & disk management product for $29.95. PrintFolder Pro 3.21 is available at regnow and No Nonsense Software website. PrintFolder Pro 3.21 supports different languages (including English). It works with Windows 98/XP/Vista. We have tested PrintFolder Pro 3.21 for spyware and adware modules. The software is absolutely safe to install. We has completely tested file & disk management software PrintFolder Pro 3.21 many times, written and published the interesting article and uploaded installation file (1240K) to our fast server. Downloading PrintFolder Pro 3.21 will take minute if you use fast ADSL connection. View and print disk contents with this simple program.